Held as an extension of Fair Food Week 2017, the Food Sovereignty Convergence will attract farmers, consumer advocates, right to food activists, urban agriculturalists, educators, communicators & innovators, and is open to anyone who sees themselves as part of Australia's food sovereignty movement. Topics up for discussion this year include issues around genetically modified (GM) technologies in agriculture, the impact of regulation and planning schemes on small-scale farmers, hunger activism and the 'right to food', and food sovereignty at a global level. In addition to the un-conference agenda, the closing of the first day of the convergence will see Bruce Pascoe discuss reconciliation of First People's land management with the new movement of regenerative farming. Following this, a potluck dinner, for which separate tickets can be purchased, will be held on the Monday night at Canberra City Farm. Penny Kothe of Caroola Farm, the Southern Harvest Association and AFSA Secretary, has said "Food Sovereignty should be important to all Australians. It represents one’s ability to choose who and where they buy their food from and in the case of farmers, to produce food that is a reflection of our deep understanding of how the land, animals and people are all interconnected. This year, Bruce Pascoe is set to highlight the importance of events such as the Food Sovereignty Convergence in recognising the impact of First People's land management practices, and how the future of farming could look if we work with the First Peoples of Australia to utilise their ‘grossly undervalued’ knowledge to improve farming systems in this country. "Imagine re-educating the nation and utilising the two major crops of Aboriginal Australia: yams (as well as other root vegetables) and grains. All of these plants were domesticated by Aboriginal people and these are the plants which offer the most exciting prospects for farming today." 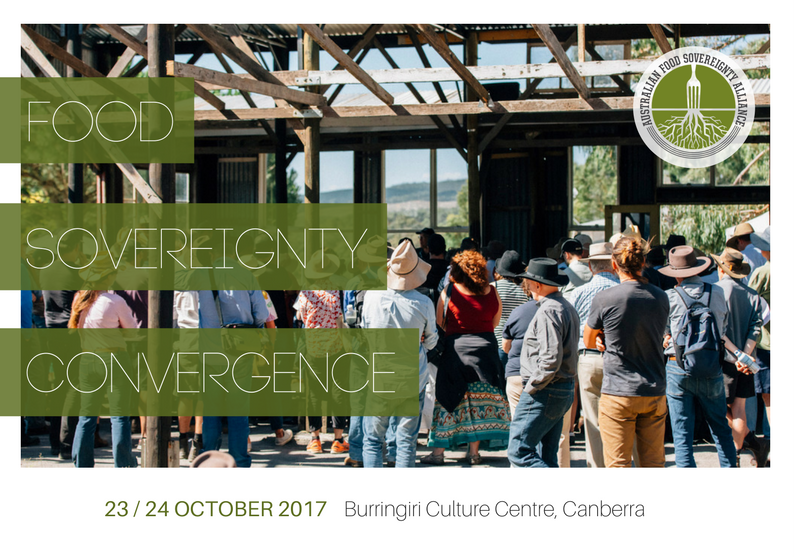 Tickets for the 2017 Food Sovereignty Convergence can be purchased via the AFSA website or the Try Booking event page.